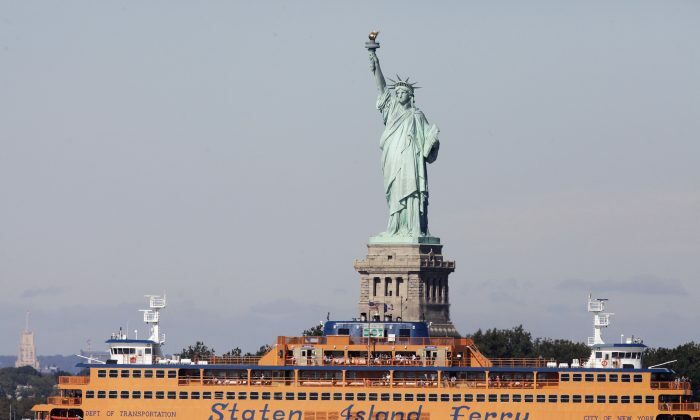 NEW YORK—The City Council voted unanimously Oct. 9 to expand service of the Staten Island Ferry. The new law, if approved by Mayor Michael Bloomberg, would mandate ferries to operate at intervals of 30 minutes or less. The changes would take effect within six months after the mayor’s signature. The ferry currently operates every 15 minutes during rush hour and scales back to hourly service at nighttime. On weekends and holidays, the hourly service begins in the evening and lasts into early morning. The schedule was codified by the City Council in 2005. Advocates for changing the schedule, including Republican mayoral candidate Joe Lhota, argued that Staten Islanders have only one other mass transit option during nighttime. According to testimonies filed with the City Council, the current nighttime, weekend, and holiday service is detrimental to businesses, residents, and tourism. The city’s Department of Transportation (DOT) opposed the schedule change, citing lack of nighttime ridership and lack of funds. Meanwhile Staten Island’s population is growing faster than any other borough, according to the New York City Economic Development Corporation. The ferry has operated on a round the clock schedule every day of the year for over a century. It is considered one of the most reliable forms of mass transit with a 96 percent on-time performance record. The DOT opposed the schedule change. Kate Slevin, the assistant commissioner of intergovernmental affairs for the DOT, testified at a transportation committee hearing in June that the total overnight ridership on the ferry makes up only 3 percent of the daily average. On some nights, Slevin said, the number of ferry riders ranges from single digits to a few dozen passengers. The ferry’s smallest Austen Class boats are built to carry more than 1,100 riders. The extended service would increase the cost of nighttime service from the current $3 million to $26 million. The Staten Island Ferry is free. DOT estimates the cost of nighttime operation at $4.59 per passenger. Even if ridership doubles given the new schedule, the nighttime cost per rider would increase to nearly $20, with no additional revenue stream. Schedules for buses and the Staten Island Railway (SIR) are designed to meet ferries as they arrive at terminals on either side. Slevin pointed out that if neither the Metropolitan Transportation Authority (MTA) that manages the buses or the SIR change their schedules, passengers on the additional boats will be left without transit links.